Attempting a completist Shakespeare site would be as redundant as attempting a completist Arthurian site; the position is admirably filled by Terry A. Gray's Mr. William Shakespeare and the Internet. Nevertheless, Legends' focus is somewhat different from everyone else's, so here beginneth our eclectic guide to the best of Shakespeare on the web. Mr. William Shakespeare and the Internet, an annotated guide to Shakespeare resources online. Site editor Terry A. Gray writes, "From the beginning these pages have been an annotated guide to the scholarly Shakespeare resources on the Internet. By 'annotated' I mean I give my opinions about the sites and try to indicate what their strengths may be... By 'scholarly' I mean those sites that will interest serious students of Shakespeare, Elizabethan drama or the Renaissance in general." Topics include works, sources, life & times, theatre, and criticism, with extensive links. Mr. William Shakespeare's Comedies, Histories, Tragedies, & Poems will house The Internet Shakespeare Editions, whose aim is "to make scholarly, fully annotated texts of Shakespeare's plays available in a form native to the medium of the Internet." This site includes Shakespeare's Plays in their original draft spellings, and Shakespeare's Life and Times by editor Michael Best. All at the University of Victoria. Surfing with the Bard, "Your Shakespeare Classroom on the Internet," edited by Amy Ulen, Web Director for Shakespeare magazine, sponsored by Georgetown University and Cambridge University Press. 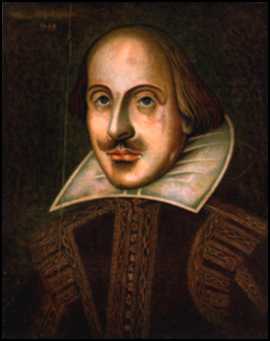 The Shakespeare Resource Center features essays, play synopses, a search engine, a brief biography, selected links, and questions-and-answers via email. The Complete Works of William Shakespeare at MIT, with glossary, is based on the Complete Moby(tm) Shakespeare, as is Matty Farrow's Works of the Bard page at the University of Sydney, with searchable HTML and plain-text versions of the plays. The Shakespeare Web is undergoing a major reorganization, but still has much material of interest. Tales from Shakespeare by Charles and Mary Lamb, an illustrated hypertext edition at Palomar College. Winter Fool, Summer Queen: Shakespeare's Folklore and the English Holiday Cycle, an essay by Kristen McDermott at the Endicott Studio Reading Room. New ! A Shakespearian Grammar by Edwin Abbott Abbott (1879), part of the Pereus Digital Library at Tufts. A feast for word-freaks. Abbott labels "errors" usages which we might prefer to call "dialectal" or merely "obsolete." New URL. The Sixteenth and Seventeenth Century History Play: A Working Bibliography by W.L. Godshalk, University of Cincinnati, is at the Richard III and Yorkist History Server. New URLs. Renaissance Forum: An Electronic Journal of Early-Modern Literary and Historical Studies. Early Modern Literary Studies is a "refereed online journal serving as a formal arena for scholarly discussion and as an academic resource for researchers in the area." It has published a special issue: New Scholarship from Old Renaissance Dictionaries: Applications of the Early Modern English Dictionaries Database, featuring Did Shakespeare Consciously Use Archaic English? by Mary Catherine Davidson and An English Renaissance Understanding of the Word "Tragedy," 1587-1616 by Tanya Hagen, both of the University of Toronto. Legends' Rapier & Dagger page provides access to sixteenth century texts on fencing.